Capture One CH is a professional Rapid Capture Solution dedicated to the Cultural Heritage community. 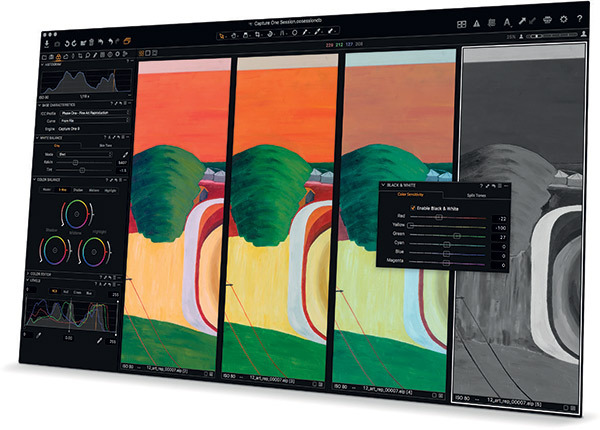 Built on the renowned Capture One software, the Cultural Heritage edition offers a highly specialized feature-set that delivers a significantly faster reprographic workflow during both capture and post-production. 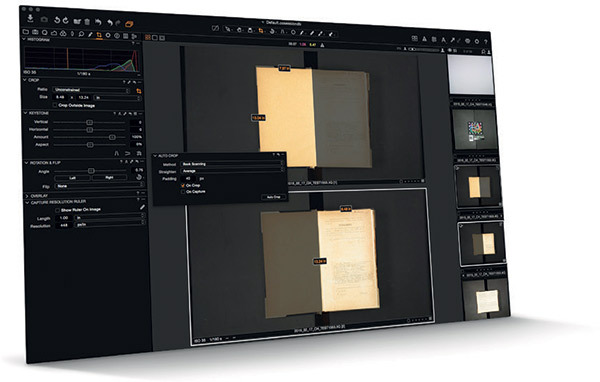 The new Slipstream mode – a simplified user-interface front-end provides for capturing to be handled by less-skilled operators and speeds up the workflow especially when working on large collections and large volume of documents that needs digitization. Use Capture One CH to optimize your images. 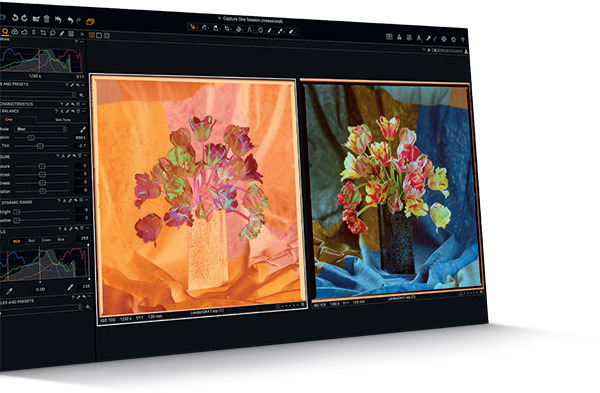 Not only do you get the highest image quality from the advanced image render engine, you also have access to powerful adjustment tools to fine-tune your images for final presentation, digital asset management, for archival and retrieval, and much more. Advanced auto cropping of film rolls and strips that includes straightening and post-crop auto levels optimization. The Resolution Ruler delivers verification of the capture resolution at any given camera position. 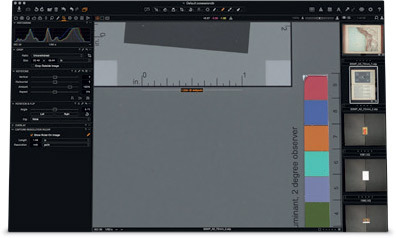 It allows for marking up a known length in the target subject matter, in inches or centimeters, and calculating the exact capture resolution. not require the full resolution of the camera where 2 pages can be captured and separated on the fly. resolution, magnification and Field-of-view. The data is calculated for current camera position and delivers precise data for re-positioning the camera to capture at target PPI, magnification or Field-of-view. Slipstream delivers a simplified, easy to use capturing interface allowing non-skilled operators to handle the capturing process. Slipstream is working on-top of the Capture One CH platform. This facilitates interfacing and access to the admin tools for camera setup, for post processing, and for image storage matching the needs of both simple and advanced networking environments. A Capture One CH workspace is a logical setup with a Collection of tools customized to optimize a given CH workflow. Workspaces may be made for tailoring the user-interface for preparation, for production and for file storage. It can include the required capture and processing tools for specific Reflective or Transmissive materials. Workspaces can be used by both admin and Operator personnel. work for both flat art and three dimensional objects. Available for common studio light types such as flash, LED and tungsten as well as for specific types of film. Phase One Capture One CH builds even more value with Slipstream for Windows, an extension of Capture One CH, built-in with each standard 4 seat license starting with Capture One CH 11.2. Operating as a new mode on PC touch screen computers, Slipstream provides a simple touch screen based workflow that does not require a skilled operator. An Administrator or skilled operator sets up the workflow with size, resolution and standard required settings and then enables Slipstream. The operator now places the object, checks focus and takes the capture. Operators can delete images, retake images and insert images if an object is out of order. 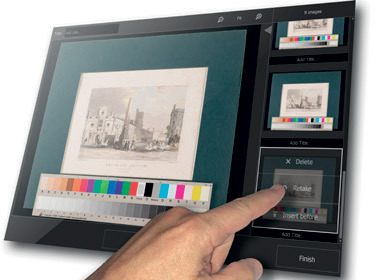 Input and control of Slipstrean can be handled with a touch screen or in combination with a Keyboard.